The Chinese PC manufacturer Lenovo has been accused of running a "massive security risk" after researchers found flaws in its software. Three vulnerabilities could be exploited to install malware on users' systems or to hand attackers a measure of control over them, it was reported. 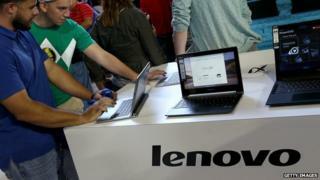 Lenovo acknowledged the findings and urged users to download a patch to resolve the issues. The news follows revelations about pre-installed adware on Lenovo systems. The vulnerabilities were discovered by researchers at security firm IOActive, who alerted Lenovo to them in February this year. The patch was released in April, but the researchers' findings were only made public this week. One flaw would allow both local and remote attackers to "bypass signature validation checks and replace trusted Lenovo applications with malicious applications", the researchers found. That might have exposed Lenovo users to so-called "coffee shop attacks", in which attackers hijack a connection to a public wi-fi network. The attacker could "exploit this to swap Lenovo's executables with a malicious executable", the researchers wrote. The other two flaws would allow attackers to gain a greater level of control over a system than they should have. That would potentially allow them to run malicious commands, according to Prof Alan Woodward, a security expert at Surrey university. "Lenovo have been found wanting again on the security front," he said. "They seem to be exposing users to potential remote hacking this time." Prof Woodward said that, following February's reports that Lenovo had exposed users with adware installed on its systems, the latest revelations were "very disappointing". Lenovo was building a "lamentable record for security", he added. The firm was forced to remove hidden "Superfish" adware that had been pre-installed on its machines, potentially compromising users' security. It offered customers a tool to remove the software, which has been likened to malware in the way it interacts with systems. A Lenovo spokesman said that its development and security teams had worked with IOActive on the vulnerabilities it found in Lenovo's system update feature. The researchers gave Lenovo time to fix the problems before their findings were made public. The computer manufacturer added that users would now be prompted to install the updates. "Alternatively, users may manually update System Update as described in the security advisory," it said. "Lenovo recommends that all users update System Update to eliminate the vulnerabilities reported by IOActive."